Travel writer Vivien Devlin and her partner experience the delights of the Rufflets Hotel in St Andrews, a family-owned hotel which is a well-known hostelry, just outside of the university town. The year 2002 is the Golden Jubilee of Her Majesty Queen Elizabeth who came to the throne in 1952. 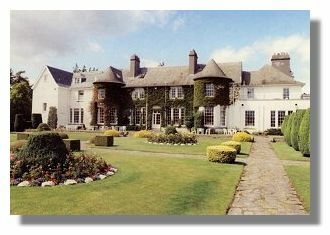 By happy coincidence it is also the Golden Jubilee of Rufflets Hotel, just outside St. Andrews. This delightfully attractive country house hotel, has been owned and managed by the Cook family across three generations for 50 years. Today, Rufflets is run by Ann Murray Smith, daughter of the first owner, and her two sons, Christopher and Mark and a management team. The original house was built in 1924 for Mrs. Anne Brydon Gilroy, the widow of a prominent Dundee jute baron and designed by local architect Donald Mills. A family crest with the initials ABG 1924 is engraved into the stone above the garden door. With its elegant proportions, rounded twin turrets covered in ivy, and lattice windows facing onto a formal garden with elaborate topiary, sundial, borders and neat lawns, it is reminiscent of a typical English country mansion. The truly charming design, with comfortable drawing rooms and elegant Garden dining room, emphasises the authentic homely qualities amidst a quiet and peaceful rural setting. Traditional white tables and chairs (not plastic) are placed invitingly on the patio outside the French windows, an ideal spot for tea and scones or perhaps a glass of chilled wine on a summer's day. The house has undergone careful renovation and development over the fifty years, increasing from seven original bedrooms to twenty-four individually styled rooms including three suites. New for 2002 is a separate lodge in the grounds, with three bedrooms and two bathrooms, lounge and dining room suitable for a family, or group of friends who wish a private home-from-home. Modern comforts have been added to the period furnishings to offer guests satellite television, radio, direct dial telephone, hospitality tray, trouser press and hairdryer. We were staying in the beautiful Gilroy Suite with small sitting room and a four poster bed, each room overlooking the garden. The dark walnut dressing table, wardrobe, chairs and furnishings are very much of the period and it really felt that very little had changed since Mrs. Gilroy's time in the pre-war days. The only addition is a modern and luxurious bathroom. 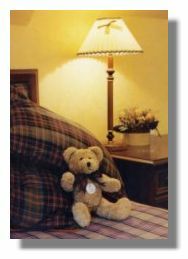 A vase of fresh garden flowers was a welcome touch and also a sweet little teddy bear sitting on the bed. This is Rufus who is your cuddly companion during your stay, but he's also useful as a rather special 'do not disturb' sign. If you put him outside your door, housekeeping or other staff will not intrude on your privacy. We arrived around 5pm on a rather chilly June afternoon so we were delighted to see we had our own coal effect gas fire in the sitting room. This was a cosy place to sit for a cup of tea and homemade shortbread while browsing through the weekend papers. Soon time for dinner. A hot, relaxing bath and then change into something appropriately elegant. I should have dressed as a 1920s flapper! We went downstairs to the lounge, for an aperitif as we studied the menu. 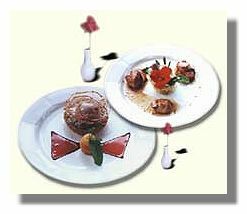 Ensure you have been out in the open air or had a round of golf to build up an appetite as you will be presented with a superb four course dinner. Soup with style - Butternut squash soup with a vanilla cappuccino or smoked haddock and leek crepe - both absolutely fabulous - and that was just to start! Then an intermediate dish of fresh tagliatelle with spinach and crayfish sauce. A breather before tackling a platter of grilled monkfish wrapped in smoked salmon with spring onion mashed potato and stuffed courgettes. Alternatively, Seared Rannoch venison with foie gras, dauphinoise potatoes and fresh asparagus, one of chef Mark Pollock's signature dishes. Then perhaps rich dark chocolate fondant with white chocolate ice-cream or a classic lemon tart with cream. We selected to share the cheese board, which had a menu all by itself. Back to the lounge to collapse into the sofa for coffee and petit-fours. 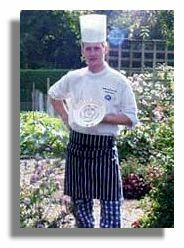 The cuisine is definitely of excellent gourmet quality served in the beautiful Garden Room restaurant with views over the immaculate lawns outside. Breakfast is served here too but you have to be up bright and early even if you are on holiday. We were the last guests downstairs at 10am and nearly missed out! Even after such a superb dinner we still found space for fresh fruits and yoghurt, scrambled egg and smoked salmon, toast and coffee. Time for a walk. 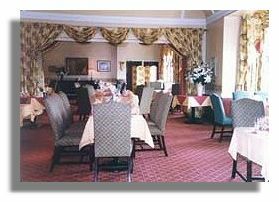 The ten acres of grounds are a well-designed blend of the formal and a country garden. Orderly matching round borders contrast with a meadow full of tall grasses and wild flowers, and curving paths lead to herbaceous borders, a putting green and a kitchen garden providing the chef with fresh vegetables, fruit and herbs. In 50 years Rufflets has certainly developed both in size, rooms and standard of service. In 2000 it was awarded three Red stars by the AA in recognition of its outstanding comfort and hospitality. The Tourist board has also presented Rufflets with a prestigious five star award in recognition of its world class standard. Rufflets is a perfect retreat for a quiet weekend in the midst of the beautiful Fife countryside, yet within easy reach of St. Andrews and its choice of golf courses. Tour from here to the quaint fishing ports of Crail, Anstruther, Elie and Pittenweem. 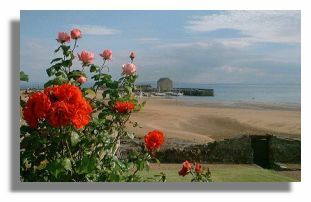 There are superb coastal walks linking one village to the other along the cliff paths or across the sandy beaches. Then after all that exercise in the sea air you will be ready for another four course dinner back at Rufflets Country House. We drove to Rufflets and around Fife in style, in a Saab 9-3 convertible from Guy Salmon - you can read an account of our experiences with the Saab here.